Our next Halloween special installment involves everyone’s favorite modern Stone Age family, the Flintstones. Unlike the myriad of anachronistic Christmas specials, the Flintstones have had (to my knowledge) only one Halloween special, “The Flintstones Meet Rockula and Frankenstone.” This hour-long special debuted on NBC in 1980. It was part of a series of Flintstones primetime specials NBC aired at the time. In a secret lab in the castle, a bolt of lightning brings to life a Frankenstone monster. The monster proceeds to revive his long-comatose creator (Rockula himself), hidden elsewhere in the castle. The two monsters scare everyone, save our heroes, out of the castle. Shortly afterwards, the Flintstones do meet Rockula and Frankenstone (just as the title promised!). Cue various chases through the castle, with Rockula trying to make Wilma his new bride. The gang (eventually) escape for home. I enjoyed this special. It’s usually fun to see Fred and company encounter actual monsters. The gang meeting such dates back to their neighbors, the Gruesomes, on the original series. As usual, it’s also fun to see prehistoric versions of modern aspects. However, the Stone Age gags get downplayed in favor of mock-horror elements instead. We also see that electricity does exist in the Flintstones’ world, at least as the tool of mad scientists. 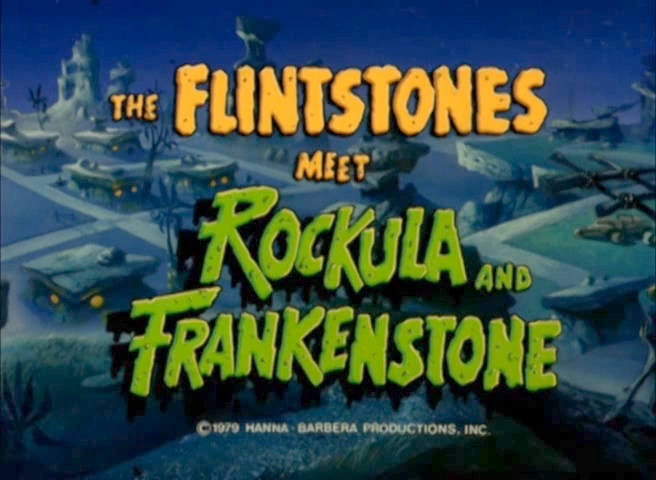 Rockula and Frankenstone, or the concepts of such, differ here from other Flintstones specials. Rockula appears in an episode of 1979’s “The New Fred and Barney Show” as a new neighbor of Fred’s. That version of Rockula, however, is already married. The one in this special, who resembles the Universal movies’ version. “The New Fred and Barney Show” featured a Frankenstone who was the property manager for a creepy apartment complex. The primetime specials presented Frank Frankenstone as a new neighbor of Fred’s. Fred initially distrusts Frank, but comes to become friends. Frank’s shown as good-natured, and speaks in a Boris Karloff-esque voice. 1980’s “The Flintstone Comedy Show” featured a different version of Frank. This version resembled a crankier version of Herman from “The Munsters.” Frank and Fred constantly argued with each other, though their families were friends. Frank also spoke in a high-pitched voice. Frank’s family here is slightly different from the one in the primetime specials. “The Flintstones Meet Rockula and Frankenstone” usually airs on Boomerang during October. New Scooby-Doo and Looney Tunes series are heading to... Boomerang? Next Post:Xubuntu 11.10 released today!